Those McCraws ❤️. So strong, so sweet. Love you guys. And love woding with you! Keep crushing it all. Mac and Haley found CFHSV early in thier move to Huntsville and have been a staple ever since. They’re good CrossFiters but that pales in comparison to who they are. These two have made CFHSV a better place since their first day. Great pic of a couple that started a life together and staying fit is part of it. These folks embody everything golden with CFHSV. Proud to call Mac Daddy and Hay Hay my friends. Love these two amazing people!! They really are “The Incredibles”—super smart, super strong, super nice & super pretty! 😊😆 Always a good day when they are in the gym! Doesn’t get much better than these 2. 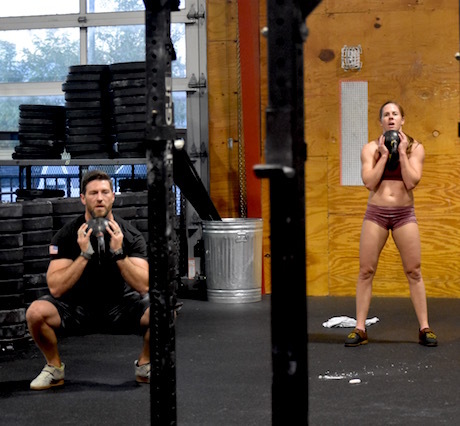 Mac and Haley are two great people, who also happen to be outstanding CrossFitters. Keep it up studs! Awesome pictures of an awesome couple 😁 Through the years, we’ve had the pleasure of getting to know so many wonderful people — through coaching, through training, through shared CrossFit experiences and through shared life experiences. And the result is often a genuine friendship. So glad these two found CFHSV and proud to call them friends. There are not two nicer people!!! Mac and Haley are the best!!! You won’t find much better people in this world; we are lucky to have them in our gym (and our lives). Awesome folks! 👌 Keep killing it you two! Mac and Haley….two of the things I love most about this gym. Mac and Haley are great athletes and folks to have in the gym. Mac & Haley are awesome. Really, really awesome. Wow! There are way too many good things I can say about these two. Two of my very first friends here in Huntsville and it’s been a fun ride ever since. These both are some amazing Crossfitters and friends. Love you both. Bad to the bone Crossfit couple! Goals! Love these two fit and fabulous friends of ours! Great example of love: their marriage, their sweet girls, and their community. They show it everywhere. Mac and Haley are two of my favorites. Always nice and caring. Hope you both have a great day. Thank you all so much for the kind words. We truly feel blessed to be a part of this community! 17:10 rx+. All row and s2o at the end. – Mac and Haley!!! Two amazing athletes!!! Two awesome friends!! !